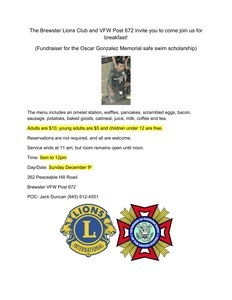 The Brewster Lions Club and VFW Post 672 invite you to come join us for breakfast! Oscar Gonzalez was a 14 year old Brewster HS student who tragically lost his life in a drowning incident this fall. The hope is that enough money will be raised to provide Safe Swim lessons to students of this school district that are in need to hopefully prevent something like this from happening again. 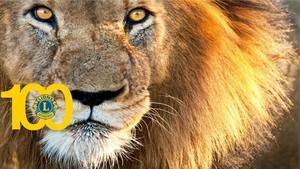 The menu includes an omelet station, waffles, pancakes, scrambled eggs, bacon, sausage, potatoes, baked goods, oatmeal, juice, milk, coffee and tea. Adults are $10, young adults are $5 and children under 12 are free. Reservations are not required, and all are welcome. Service ends at 11 am; but room remains open until noon.